AzhwAr was asked “you are saying that only emperumAn is fit to be attained. But wherever we see, there are people who are trying to attain and those who are trying to be attained”. AzhwAr responds “unlike the situation where emperumAn showed himself to me for me to see, the others [who are not devoted to him] are trying to attempt to see on their own; emperumAn has created an illusion so that they are unable to attain him”. In SrI bhagavath gIthA 9-23, krishNa tells arjuna “thE api mAmEva kaunthEya yajanthi avidhi pUrvakam” (those who worship other dhEvathAs (deities) worship only me, but against the rules) and in SrI bhagavath gIthA 7-14 he says “mama mAyA dhurathyayA” (it is very difficult to go past this illusion). dheyvaththu isaiyum karumangaL ellAm – all the activities of these deities. One deity is given the role of creating, one for destroying, one for destroying everything etc. All these activities have been ordained by emperumAn only. asaivil sIr – the qualities of emperumAn do not contract or expand based on time. They are always fully with him (it is implied that in the case of other deities, this is not so; their qualities will shrink or expand). kaNNan – he incarnated himself to show these qualities, as a simple person. He made himself as equal to others through his ichchA (wish). asaivil sIrk kaNNan – even though he incarnated himself as being equal to others, his qualities do not have shortfall. While he created other deities and gave them name and fame, their qualities are not consistent and change. nedumAl – mAl means greatness. Even though he makes himself simple, he is so great that no one can measure [know] him. thaiththirIya upanishath Anandhavalli says “yathO vAchO nivarthanthE” (words return, unable to measure emperumAn’s qualities). Alternatively, mAl also denotes infatuation. He is so infatuated with his devotees that he will never let them down. kadal kadaindha – even though he is great, he carries out impossible tasks to protect his devotees [such as churning the ocean to grant immortality to dhEvathAs to enable them to fight demons] . He needs people who pray to him “please give us this”. Just as other means [such as karma, gyAna, bhakthi etc] need his mercy, the other deities too need his mercy. For his devotees, the other means and other deities are to be avoided completely. 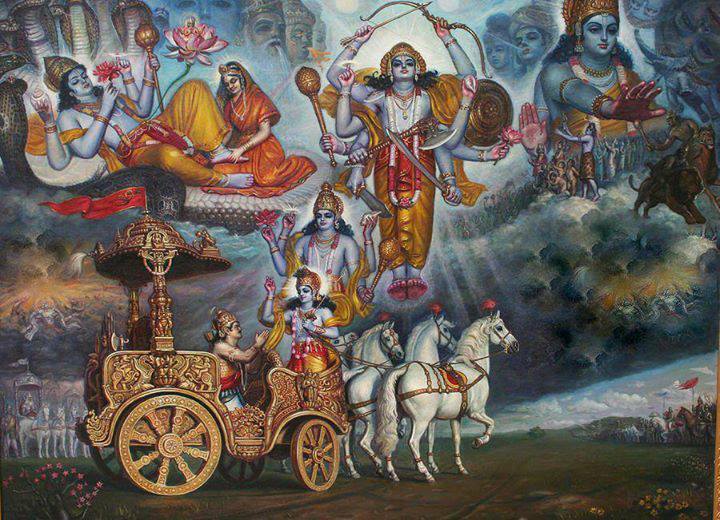 kArOdha vaNNan – even if he does not carry out any of these tasks and even if he brings an end to us, his beauty is such that we will never let go of him. We shall take up the 8th pAsuram next. This entry was posted in iyaRpA, mudhal thiruvandhAdhi on June 15, 2017 by T N Krishnan.